When school leaders mention the phrase school climate, they usually don’t use the term “climate” literally. Conversations about school climate center largely around such issues as student engagement or safety and well-being. But, the physical condition of a school is just as important as its social-emotional environment. And, too often, that condition gets overlooked, or is disregarded. That’s according to the National School Boards Association (NSBA), which recently launched the Clean, Green, Safe Schools campaign. As part of the initiative, NSBA will consult with school board members on how best to make school buildings safer, more cost-effective, and more environmentally friendly. When budgets are tight, facility upgrades are often among the first items cut. But neglecting the safety and sustainability of your physical campus can end up costing you more in the long run, says NSBA. Think back to last year’s teacher “sickouts” in Detroit, where teachers cited rat-infested hallways and crumbling walls as motivations for a massive strike. If you’re struggling to make the case for facilities upgrades in your buildings, here’s a few important points to keep in mind. The Environmental Protection Agency (EPA) estimates that K12 schools save up to $2 billion annually by making their buildings more energy efficient. Investments in better insulation, recyclable building materials, and a renewable energy infrastructure all contribute to future cost savings. 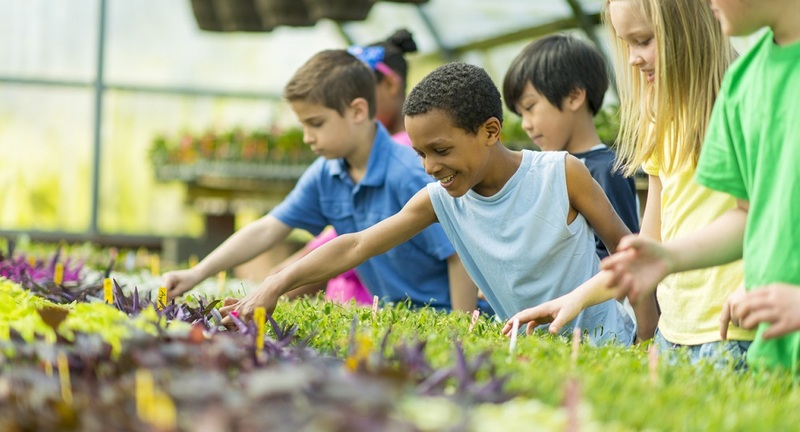 Inter-Lakes School District in New Hampshire is committed to greener school operations. The district recently began implementing a 10-year plan to improve energy efficiency. School leaders partnered with Honeywell to install efficient ventilation systems, LED lighting, and solar panels. The district plans to significantly reduce its reliance on oil consumption by year’s end. New learning and engagement strategies are among the best ways to improve students’ performance. But don’t sleep on the power of more efficient and secure buildings. Air quality affects student concentration. Polluted air or uncomfortable temperatures can throw students off task. Loud classrooms can hurt student comprehension. Sunlit classrooms have been shown to improve student learning. Even the colors of a classroom’s walls can change students’ mood and behavior. Successful, healthy, and engaged students are more likely to contribute to your local community and to give back to the local economy. And the value of America’s public schools to the national economy can’t be overstated. 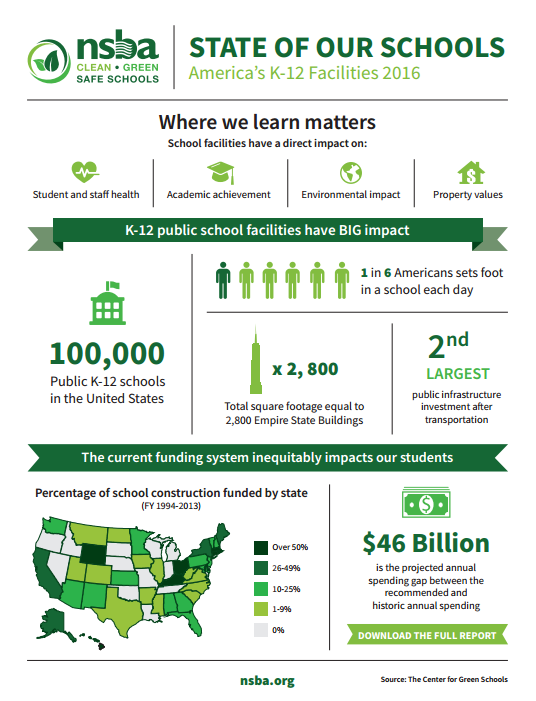 NSBA released a helpful infographic (see below) using new data from the Center for Green Schools that shows the relative size of that footprint. Chew on this: One in six Americans walk into one of 100,000 schools every day, the infographic shows. What steps is your school district taking to make its facilities more efficient? Tell us in the comments. For more on how to make the argument for school improvements in your community, read How to pass your next bond measure. Be the first to comment on "Making the case for safer, greener schools"